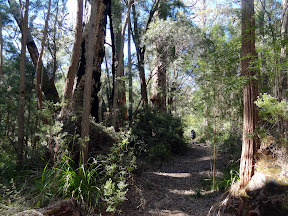 So after commiserating with the hut-dwellers about their rodent damaged goods, and they headed off, we finally did too: into a morning of very big trees! So we gradually go packed up, and as usual, people headed out in their groups. Beautiful clear skyed day, without cloud. 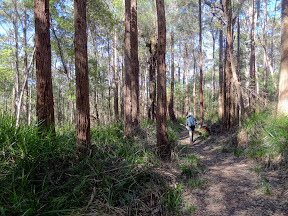 Wonderful forest again this morning with an awesome view through the trees – some very large trees too – the biggest Jarrah trees we've ever seen! 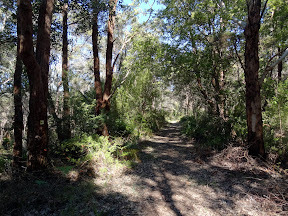 After crossing the South Coast Highway the track passes through the [very much] remains of Mark's Siding and then onto the Denmark–Nornalup Rail Formation, which is now used by more than one track. Finding the track up to the crest of the hill must have confused some walkers, which frustrated local land owners (though we didn't have any such problems). Discovered on the rail formation after South Coast Highway, that the FUSE had not been switched back to 6V from when it was switched to 12V at Long Point to charge the camera battery. Bit disappointed really. It was good sun today, but the FUSE was still only on 1 light at lunch (at the viewing platform). We were starting to get a little concerned that something had failed: but getting close to the hut the FUSE was up to 2 lights, and is at 2 lights @3:45 (with sky starting to haze). The GPS batteries kept charging, and emptying the FUSE battery, so maybe it was very empty? After the magnificent views from around Nut Road Lookout (we didn't actually find the real lookout), the track descends through Red Flowering Gum woods (not when we were there: but there were an abundance of sandy species flowering beautifully) and eventually to a large granite slab that the Guidebook said had great views. Because it was so hot we had morning tea on the tack in the shade of the low trees. It was very warm on Ficifolia Road (named after the Red Flowering Gum), and after turning off onto a track again, we were very happy to find some water to wet our bandannas in a swampy area between sand dunes. I had blown it and not checked the track water last night and P's ran out very early in the piece. Really expected to see snakes today, but not one. Did see 2 Bobtails together. Quite hot and sweaty before we hit the beach. The walk to the beach (our intended lunch stop) was along the top of sand dunes that gave wonderful views of the coast ahead. We reached the viewing platform to find our YHA co-walkers just finishing their lunch. The view from the viewing platform was great, and it was lovely to sit in the sun for a whole hour. The boys headed off and we & the FUSE lingered, soaking up the sun. Though, we were getting a little confused with the performance of the FUSE. After a long lunch and relax we headed down to the beach via the toilet (with water tank) and off to the Conspicuous Cliffs. Spot worried about the FUSE, it just doesn't seem to be working like it usually does. Will have to see. Toe still playing up. Had water at beach, ditched rubbish and went to toilet. Had lunch at whale watching platform. No whales, but a sea eagle did a great fly by. 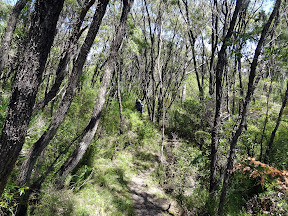 The climb off Conspicuous Beach looked significant on the height profile, and we gritted our teeth as we marched up the sand dunes then up the limestone hills. Wind came up at beach, as did flies. Really quite a straight forward walk across and I think we did it pretty well, particularly the last climb up behind the Conspicuous Cliffs, which I must say was great for views. Lovely flowers across the dunes. Some hazard reduction burns happening, now quite a haze. Once past the backside of Conspicuous Cliffs it's a very short walk into the campsite, which we spotted from a wee way off: and then, quite suddenly we arrived! The campsite has great and close tent sites, almost within a maze of coastal shrubbery. Everywhere has an awesome view and great sun. The wind of the ocean is cool, and we all chilled off quickly after arriving, slowly putting on layer after layer. Nice hut with good views and a glassed in area on the side of the hut normally open giving some wind protection. Still fairly wind chilly though. 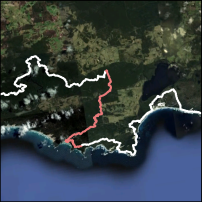 1 morning tea and 1 breakfast Rest Point to Peaceful Bay → Calculation Error?? Another transition from forest to dune – this one may be not as brilliant as the previous (which was?) but still unbelievable to think we were in tall forest this morning and dunes this afternoon. Looking at what I hoped were Hazard Reduction Burns, we remembered Sandie's last End-to-End attempt that ended in Denmark, when everyone was pulled off the track because of bushfires. Sandie's last attempt at an End-to-End scared us a little when we realised how out of control we really were over our future. She just laughed about it... but I think we would have been guttered to get all that way and not be able to complete the walk. We did our normal lucky-dip for dinner, and made a small adjustment for breakfast tomorrow. Because of the miscalculation we have to use one of our emergency dehydrated meals for breakfast tomorrow: looking at the lucky-dip selection and our emergency spares we opted for Beef Curry for breakfast and Fish Pie tonight (it is Friday after all). 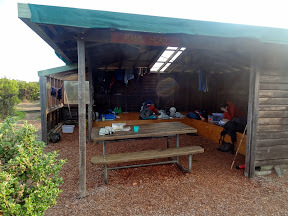 The conservatory addition to the shelter was a wonderfully, protected space for dinner, and indicated that the shelter probably got a lot colder when the cool breeze was more of a cold wind. The fires we saw from the sand hills produced quite an amount of reddish-brown haze, which probably was not great for the FUSE, but it was great for the sunset.